Chad Doehring, recently named Vice President of Operations for Duncan Aviation’s Provo, Utah, location, has always loved the mountains. Born and raised in Arvada, Colorado, he spent much of his childhood enjoying hiking, skiing, and camping. After he graduated high school, he won a full-ride scholarship to Colorado AeroTech, where he earned his Airframe & Powerplant license. Upon graduation, he worked for a short time at an FBO in Leavenworth, Kansas, and then moved to Palmdale, California, to work for Northrup Grumman on the B2 Bomber program. In 1994, he was offered a job at Duncan Aviation’s Lincoln, Nebraska, location as an airframe technician for Hawkers and Falcons. Since then, Chad has increased his responsibility through promotions and job changes. Some of his most recent positions include Airframe Services Manager and Customer Service Manager, both in Lincoln. In 2017, he decided to move back to the mountains and transfer to Provo to help build the future staff and facility there. Chad and his wife, Stacey, have relocated to the Provo area. They are excited about the move, especially because of the recreational and community activities the area has to offer. They are also pleased with the friendly people and the way the community has welcomed them with open arms. Chad and Stacey have four nearly-grown children, twin girls and two boys. Since three of them are in college and the fourth is in his last years of high school, the kids stayed in Nebraska. Chad and Stacey get back to Lincoln frequently right now for interviews and meetings, and the kids like travelling to Utah for occasional breaks. More than 500 of Duncan Aviation’s 2,150 current team members are actively in the military or are military veterans. That’s roughly 24% of the Duncan Aviation workforce. “Members of the US military are dedicated individuals who bring a unique set of experience and skills to the Duncan Aviation team,” says Jennifer Monroe, Duncan Aviation’s Senior Talent Acquisition Specialist. “Many career skills, both hands-on and soft skills, gained during active duty, transition effortlessly to a position with Duncan Aviation. Duncan Aviation partners with a variety of military organizations throughout the county to connect with individuals who are transitioning out of full-time service. Entering civilian employment is a major life adjustment, but there are many aspects of Duncan Aviation that veteran team members say remain the same: attention to detail, focus on getting the job done right, and the support from fellow employees. 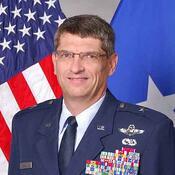 Duncan Aviation is a proud support of the Guard and National Reserve (ESGR). As an employer, Duncan Aviation provides managers and supervisors with the tools needed to effectively manage employees who actively serve in the Guard and Reserve. We also pledge our support to hire veterans returning from service to our country as part of the Utah Patriot Partnership Program and as a Michigan Veteran Friendly Employer. “Service to our country is something that is important to all of us,” Jennifer says. Finding the answer to almost anything is easy. Want to know tomorrow’s weather? Google it. Check your weather app. Or just ask Alexa, the voice-activated virtual digital assistant welcomed into the homes and offices of the tech-savvy. 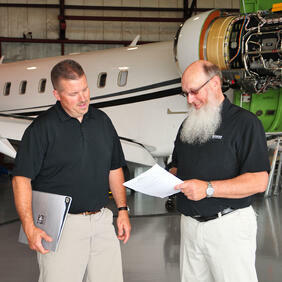 At Duncan Aviation, we strive to make answers to your aircraft-related questions just as easy to locate. These are just a few of the things you’ll find there. 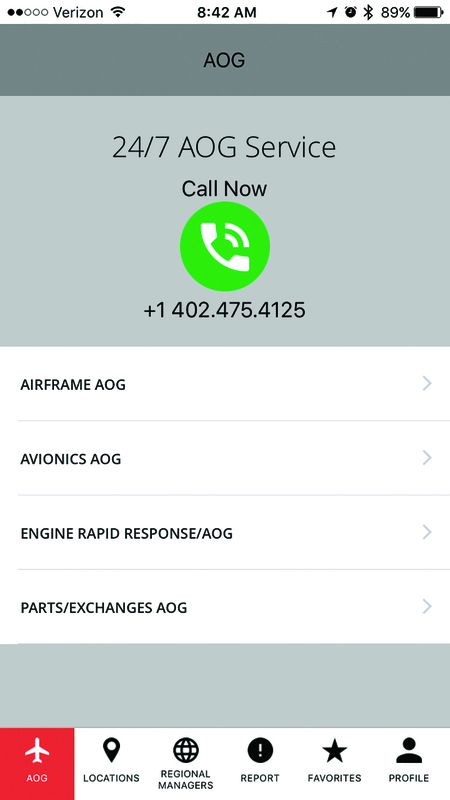 Apps - Easy access to the four “apps” that Duncan Aviation has available. Certificates - Copies of our aviation authority certificates, divided by location and authority. Duncan Debrief - Online edition, PDF version and iPad edition. Duncan Download Blog - We publish new blog articles at least weekly. Subscribe and new articles will be emailed to you. Duncan Intelligence – This monthly technical email newsletter provides technical tips for all of the aircraft makes and models we work on, as well as their accessories, components, avionics and parts. Events Listing - Check out the Events Calendar and then look for our booth, table or show reps.
Fact/Capability Sheets – See a quick look at the extensive capabilities we have for our main service areas, which includes aircraft sales, airframe, avionics, completions, engine/APU, engineering, FBO services, OEM services, parts and components, specialized services and government programs. Field Guides – See these technical white papers on things like corrosion detection, aircraft paint, and cabin entertainment. Galleries – Find paint and interior inspiration with its stunning photographs of some of our recent and unusual paint and interior completions and refurbishments. Press Releases – See our most recent news in one place. Straight Talk Books - Our popular Straight Talk series takes complicated topics and gives a broad overview of the topic to help educate and inform those in the industry about important topics. Videos – See some of our work in process or take a virtual tour of our facilities by video. You can read more about Duncan Aviation's Resources in the Fall 2017 Duncan Debrief. In 2017, the NAHI (National Aviation Heritage Invitational) invited Duncan Aviation customer Joe Duke to enter his refurbished Albatross aircraft in its prestigious airplane show. Rescued by Joe in 2008, the 1954 G-111 Grumman Albatross had spent more than a quarter of a century in the boneyard at Pinal Airpark in Arizona. Joe and his team restored the aircraft to airworthy condition and painted it with glossy paint in elegant, understated colors. Then in 2015, the aircraft came to Duncan Aviation for a stunning interior transformation. The vision and mission of the NAHI is to encourage the preservation of aviation history through the restoration of vintage aircraft to original flying condition. The Invitational promotes aircraft restoration via friendly competition, bringing valuable aviation treasures together in one venue and is a joint effort of Rolls-Royce North America Inc., the National Aviation Hall of Fame, the Reno Air Racing Foundation and the Smithsonian National Air and Space Museum. The timing of this year’s show at the California Capital Airshow couldn’t have been better. As hurricane Irma raged through the Caribbean toward their Florida home, Joe and the Albatross were safely away from the devastating storm at the Mather Airport in Sacramento, California. It wasn’t Joe’s first time at the show. In 2013, Joe was invited to enter the Albatross in the show, which at the time was part of the National Championship Air Races in Reno, Nevada. 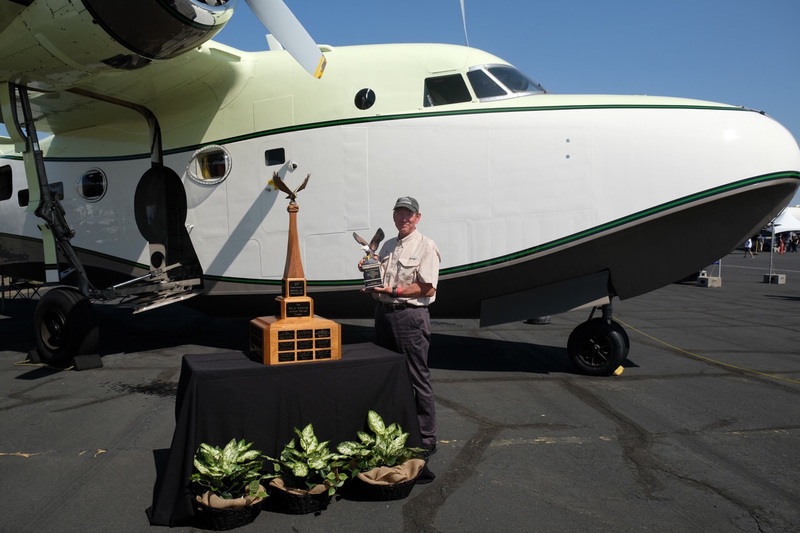 Judges bestowed the Howard Hughes Trophy (Large Aircraft) on Joe and the Albatross, and they also went home with the National Aviation Hall of Fame People’s Choice Award. This time, the Albatross was awarded the Neil A. Armstrong Aviation Heritage Trophy as the Overall Grand Champion of the show. The perpetual trophy, features a plaque engraved with Joe’s name and the year the Albatross was manufactured, to be displayed in the Smithsonian’s National Air & Space Museum’s Steven F. Udvar-Hazy Center at the Washington Dulles International Airport in Virginia. In 2015, the Albatross flew to Duncan Aviation and was fitted with its interior, which included sound-dampening materials. The Duncan Aviation production team, following the plans of Joe’s freelance designer, Bruce Shoemaker of SDesign.aero, put in numerous passenger accommodations. The crew also built two galleys, a lav, and interior panels and installed LEDs, USB plugs, dome and task lighting, and new gaspers. They updated the cockpit with side ledges and a workstation. 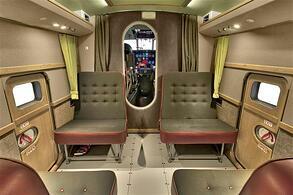 Invoking the design style and materials used in the period in which the Albatross was manufactured, the interior even featured refurbished seats that were made from vintage Grumman parts. Although LEDs were used throughout the interior, the designed and fabricated adapters retained the aircraft’s vintage light lenses and switch bezels. Our time-lapse video captures the progression from the pristine but empty cabin and cockpit to the newly completed interior. Just as every business aircraft is different, every customer is different, and they have varied service preferences. What business aircraft operators truly value in a service facility can be categorized in four main areas: Convenience, Quality, Communication, and On-Time Delivery. Duncan Aviation has long focused on these areas. But don’t take out word for it. Making services convenient is a matter of access, responsiveness and expertise. With more than 2,150 aviation experts located around the world, Duncan Aviation has model-specific and system-specific experts for the most popular business jets in use today. - Greg Hamelink, Senior Manager of Flight Operations and Maintenance. 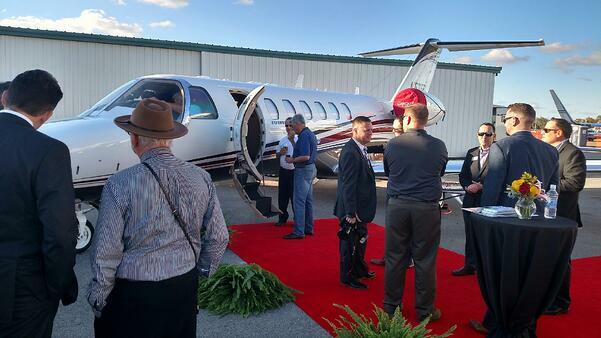 Safety is obviously a huge concern for all in business aviation. But quality means so much more than safety. It can mean everything from perfectly straight and carefully made stitches in a seat upholstery to bundled, clearly marked wires behind an aircraft’s sidewalls. 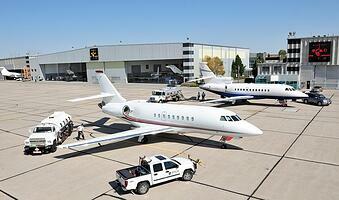 There are lots of reasons customers trust Duncan Aviation for their aircraft service work. Here are short videos about a few of the most common reasons we hear. Based on feedback from customers, they interpret project coordination to include the technical knowledge of their assigned project manager, the communication the customer received throughout the project, and the use of our online myDuncan project management tool. Duncan Aviation project managers provide customers with personalized service and aircraft project expertise. Each has a minimum of 15 years of technical experience and an average of 25+ years of aviation experience. And communication is an area where we have been told we excel. In 2016, customers gave us a 97% approval rating in the category of communication. That is attributable in part to myDuncan, which lets customers be productive wherever they happen to be. Of the 2,343 aircraft projects completed in 2016, more than half were managed off-site, allowing the aircraft representatives to stay current on project status, item approvals and budget while keeping up on things at work and at home. “It (myDuncan) makes the squawk approval process seamless. 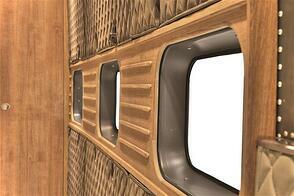 I can be on the hangar floor, in the office or at home and see all discrepancies on the aircraft. If I have questions on a certain item, I can submit a question through myDuncan and receive written responses or pictures to better display the issue. myDuncan allows the user to export numerous reports that I use to see progress and calculate budget to actual as the project progresses.” - Wesley Landgraf, Directory of Maintenance for Midland Financial Co.
Duncan Aviation develops project timelines by analyzing a database of past work and the time it previously took to complete tasks. Collaborating between all areas involved in complicated workscopes, milestones for the entire project are mapped out and the most efficient way to complete work is analyzed. We routinely push the envelope on schedule and challenge our technicians to push themselves while not sacrificing safety and quality. Customers are pleased with the results, and even more like that we meet the out-dates we promise. Nine of 10 report that their aircraft project was completed on time with no budgetary surprises. The Fall 2017 Duncan Debrief is now online. Download your copy now. A little more than 10 years ago, a team of Duncan Aviation project managers and computer programmers had a vision for a communication tool that would help them provide even better customer service and more efficient approvals and keep everyone involved in a complicated multi-shop aircraft project up-to-date. The result, which launched in September 2006, was myDuncan, a web-based portal that allows customers greater access and better control of their projects from anywhere in the world. myDuncan has been a phenomenal success. It is available to all Duncan Aviation customers with aircraft onsite for airframe, avionics, and engine projects. They can also manage send-in repairs with Component Status Tracking. Nearly all customers transform their computers and mobile devices into “virtual offices” to manage their aircraft projects whether they stay with their aircraft or not. And many travel back to their home bases. Of the 2,343 aircraft projects delivered in 2016, more than half were managed off-site, allowing the aircraft representatives to stay current on project status, item approvals, and budget while keeping up on things at work and at home. Read what Duncan Aviation customers are saying about the benefits myDuncan in the Spring 2017 Duncan Debrief magazine. “Duncan Aviation has excellent aircraft parts availability, good prices and great service. We regularly use their parts and rotables services because their quality is awesome.” –Francisco Carrillo Peralta, Purchase Agent for ALE Service Center in Mexico. With more than 15 years of experience as a maintenance and repair organization working in the Mexican market, ALE Service Center has three locations in Mexico and provides service for about 100 clients who operate Hawker-Beechcraft, Agusta, HondaJet and Bombardier aircraft. “I can trust what Duncan Aviation tells me,” Francisco says. “If they say they have a part available, they do. And their ship times are accurate and fast.” No other aviation parts company can compete when it comes to customer value. Chris will be at AeroExpo at the Toluca International Airport March 16-18. Stop by booth #20 to talk with him and other Duncan Aviation representatives. Duncan Aviation’s international parts sales experience includes parts and rotables with completed and accurate 8130 paperwork, the management of repairs and overhauls sent to the U.S. to be serviced both by Duncan Aviation and other FAA approved U.S. Repair Stations; the consolidation of return shipments of freshly serviced components back to countries all over the world; and the safe shipment of hazardous material from the U.S. to countries around the world while meeting all regulatory compliance. Just call +1 402.475.4125 to get instant service, 24/7/365, including holidays, nights and weekends. Or visit Duncan Aviation’s There’s no need to make dozens of calls and scour the internet looking for a part or service. Duncan Aviation has the component solutions you require and will quickly fulfill those needs. To see more, check out our Parts Search at www.DuncanAviation.aero/parts. You can also download our mobile parts app to search from your phone. Just visit www.DuncanAviation.aero/apps. The Charles Taylor Master Mechanic Award is named in honor of Charles Taylor, the first aviation mechanic in powered flight. 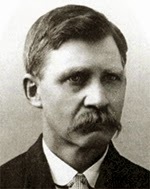 Taylor served as the Wright brothers' mechanic and is credited with designing and building the engine for their first successful aircraft. 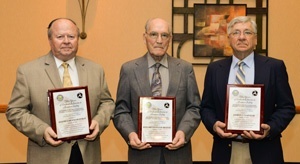 The award recognizes the lifetime accomplishments of senior mechanics. The Nebraska Aviation Mechanics Seminar committee and the Federal Aviation Administration presented them with the awards at a banquet on the evening of January 29 in Kearney. The presentation was conducted in conjunction with the annual evening banquet at the Nebraska Aviation Mechanics and IA Renewal Seminar. Award recipients are required to have worked for a period of 50 years in an aviation maintenance career and must have been an FAA-certificated mechanic or repairman working on N-registered aircraft maintained under the Federal aviation regulations for a minimum of 30 of the 50 years required. Joe Huffman, Sr., has been employed in aviation for 50 years, 48 of those years being dedicated to serving at Duncan Aviation. He was initially hired at Duncan Aviation as a mechanic. Joe first became a pilot just after graduating from Lincoln High School in 1961. After graduation, he worked for Wallace Tiller in Bellevue as a landscaper until 1963. From there, he went on to his first aviation job in 1963, working at South Omaha airport in Omaha, Nebraska. He resided there until 1965, when he moved to Denison, Iowa, and worked as a mechanic, instructor and charter pilot until 1967. He moved back to Lincoln in 1967 to work at Duncan Aviation and has remained there since. 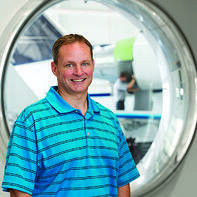 “As a longtime Duncan Aviation team member myself, I have known Joe for years. I looked up to him and was mentored by him when I first started with Duncan Aviation,” says Darwin Godemann, Master Mechanic for Duncan Aviation and Lead Program Coordinator for The Nebraska Aviation Maintenance and IA Seminar Committee of The Nebraska Aviation Council. During World War II, Bernard Michael developed a love of aviation from watching B-17s rumble over his father’s farm as they made their way from the Boeing factory toward the European Theater. When Bernard came of age, he served his country by joining the Air Force; he spent most of his military duty working Counter Intelligence in the Philippines. 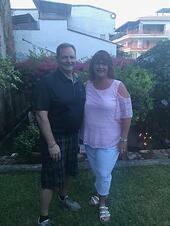 After leaving the military, he attended Spartan College of Aeronautics and Technology, where he graduated with an Airframe/Powerplant license and a commercial pilot certificate. In January 1966, Michael started his 50-year aircraft maintenance career with Douglas Aircraft Co. in Tulsa, Okla. Moving around the Midwest, Bernard repaired flight controls for Douglas Aircraft Co. in Oklahoma, performed IA inspections in Iowa, agricultural spraying in Kansas, and was a jet airframe shop supervisor for Duncan Aviation in Nebraska. Receiving the FAA’s Central Region Certificate of Recognition for Outstanding Accident Prevention was one of the highlights of his aviation career. Retired now, Michael continues to perform aircraft maintenance for friends at the Lincoln Airport and enjoys assisting with local air shows. A third aviation technician, George Czarnecki of Central Cylinder Service in Omaha, was also presented with the Charles Taylor Master Mechanic Award at the banquet.